“Originally some Danish guy invented the burglar alarm. This page is intended to help individuals that are new to the concepts involving a security system make an informed decision regarding the purchase of one and choosing a provider. Please Note: Purchasing an alarm system is very much a personal choice. Whether you decide to obtain the equipment locally or online and install it yourself, or contract an alarm company to install it for you, this FAQ should provide you with some information that will help in making an informed decision with respect to your personal security purchase. What does an alarm system do and how will it benefit me? First and foremost an alarm system will not decrease your chances of having a break-in or burglary. Alarm systems are designed to detect and inform, not prevent. At best, what a well designed alarm system will do is detect the presence of an intruder before he enters the premises. The goal here is to limit the amount of time he has to grab your stuff. When purchasing an alarm system there are a couple of things you should consider before you actually contact a security provider. Let’s start with a few quick words about three, often recurring themes. While those in the industry often state that this type of sales technique may no longer be in common practice, it still exists. It involves a sales person making vague (and sometimes specific) references to other break-ins or incidents in the prospective purchaser's neighbourhood. Any salesperson that engages in this tactic should not be tolerated (show him/her the door). A variation of this is also largely customer driven. If you have been the subject of a break-in, you must try to deal with your alarm system purchase objectively, and not as a reaction to the event, or from fear that it may happen again. You don't have to fortify your home to the point that your security system rivals that of the one used at the Loomis® armoured car depot. In most instances your insurance provider can suggest several good alarm service companies for you to talk to. "LINE SEIZURE" AND WHY IT’S IMPORTANT! I thought it worth mentioning that many so-called "FREE" systems may lack not only the physical protection you need, but could also suffer from a fatal flaw. If that "voice response" system you have can't complete the phone call to the monitoring station, there is simply not going to be "the voice" there to "threaten the burglar" with the dire consequences they're so fond of promoting. It's important for you to recognize that your system's ability to communicate is predicated not only on it's correct installation but on the proper connection to the telephone company's demarcation. If the installer is going to plug his system into your kitchen phone jack, your security system is at risk. If, during the course of your monthly test you generate an alarm signal to the monitoring station and you can hear the system dialing when you pick up another phone in the house, you DO NOT HAVE A SECURE SYSTEM! LOCAL VERSUS REGIONAL ALARM MONITORING CENTRES! While we’re on the subject of telephone lines, let’s talk about where the signals your alarm system is going to generate are transmitted to. Many local companies will heavily promote their service because their monitoring station is located in your metro area, employs local people and contributes to your community. All these are admirable qualities, but consider what’s going to happen if a catastrophic weather event or earthquake strikes. Most monitoring stations have limited backup capabilities on emergency power and their infrastructure won’t survive a protracted power failure. While telephone service is going to be disrupted both locally and/or regionally, some long distance service which relies heavily on microwave transmission may survive, because even if the towers fall (or the dishes become misaligned), alternate data pathways would likely still be available (and automatically transfer). The decision to engage a company with a local monitoring centre may have some benefit to the local economy, but in the greater scheme of things, the station that will survive a localized catastrophe is the one where the data is shared (via secure protocols) over a number of regional centres using different (often redundant) communications technologies. Please scroll to the bottom to view some frequently asked questions (FAQ) about security and burglar alarm systems! What is an alarm system and how does it work? If this is indeed your first time purchasing a security system, it's a good idea to familiarize yourself with the terminology used in the security industry. Getting a basic understanding of what makes up a modern alarm system, installation methods, and terms used will help you to make an informed decision with respect to your protection. There are two types of systems (or alarm categories). All modern home and business alarms will fall into one of these two categories regardless of whom you might be purchasing the equipment from. Some designs are often a compromise between the two, based on the individual businesses' or home owner's budget. Protects all accessible windows and doors. Essentially defines the building envelope as the perimeter of the protected area. Alarm will trigger BEFORE an intruder can enter the premises. 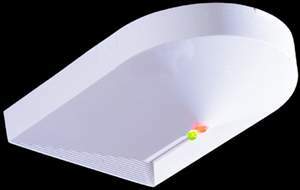 Uses motion sensors to protect areas within the building's envelope. Protects unoccupied areas of the premises. An intruder must enter the protected area in order to trigger the alarm. Note: Perimeter protection is designed primarily to protect the occupants of a building or area and is defined by a specific boundary (usually exterior or interior walls) that is best suited to the consumer's security concerns and budget. Of the two main groups of devices that comprise a modern alarm system, contact type switches are the simplest by far, and the most powerful. When properly utilized, they can detect an intrusion into the protected space even before physical entry is gained. Contacts on certain entry doors also act as "triggers" that enable the system to detect an entry of a legitimate user and give them the time required to access the control unit and disarm it (or turn it off). The most common types of contacts employ a micro switch made of very thin metal reeds that are hermetically sealed into a plastic or aluminium housing. They are either surface mounted or flush mounted into the door or window frame. Surface mounted contacts are usually secured with double sided tape or screwed onto the door frame. Wires connected to the switch terminals are in turn terminated into one of the zones of the control unit. A simple magnet is mounted immediately adjacent to the switch on the door or window itself. When the two units (magnet and switch) are in close proximity, the control unit recognizes this as a "normal" condition. When you open the door/window, the reed switch is activated and the alarm system interprets this as a "break" in the wire which in turn triggers the zone to which the switch is terminated. Most alarm systems are capable of recognizing when a switch is "tampered" with, and it is up to you as the concerned customer (not the alarm installer) to ensure that this feature is activated. 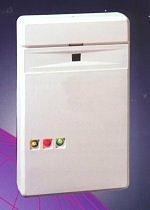 In most instances, most alarm companies will install "low security" normally closed switches and in the case of a flush mounted installation, this provides excellent protection. Surface mounted switches, however, are far more accessible to a knowledgeable burglar or dishonest employee bent on mischief, and in some applications a higher security switch may be the more prudent choice. Your professional security consultant should present these options to you during the course of his normal walk around inspection of your premise. In most instances the difference in cost between the lower and the higher security switches is not even worth mentioning. Some alarm systems require even higher security contacts. These employ a reed switch with three terminals. When an "alarm" condition is achieved (by the opening of a door or window), one "side" of the terminals will "open", and the other will "short". The combination or a single action (an opening or closing terminal) will result in a faulted or tripped zone. Still other types of contacts employ a "biased" magnet/switch combination. When an intruder attempts to bypass the magnet on the door or window with another magnet, the switch will immediately open and display an alarm condition. The simplest contact switch device is one that is rarely utilized today, although there are still legitimate applications that do crop up from time to time. This device employs a spring loaded micro switch, which looks very similar to the switches used in your car to turn on the interior lights when you open your door. One of the most innovative devices and probably the best physical intrusion sensor on the market today. This device responds to specific audio frequencies associated with breaking glass. It consists of a sensitive microphone mounted inside a plastic case and quite often is "teamed" with either a seismic or air density sensor. The two technologies working in tandem provide a virtually false alarm free detector. The physical act of dropping a glass on a tile floor directly beneath one of these types of sensors was usually sufficient to trigger a false alarm. The industry has addressed this problem by providing "dual-technology" sensors. When an exterior window pane is broken the glass itself actually "flexes" or bulges in the few microseconds after an impact and just before it physically breaks or shatters. This action, coupled with the sound made by the breaking glass is how the sensor is able to distinguish between an actual window being broken, and the accidental dropping of a drinking glass. "Flex" is by no means the only other part of the "dual-technology" equation. Other sensors incorporate what resembles a seismic sensor as part of their alarm discrimination circuitry. These types of sensors have to be mounted fairly close to the windows they are protecting, and their installation requires other "additional" considerations. They have to be attached to a portion of the building structure that is capable of transmitting the "shock" part of the equation. This may not always be possible. Your alarm consultant will also caution you with respect to curtains, and other window "treatments" that may interfere with the sensor and preclude it from actually detecting an intrusion. It's also very important for the installer to verify the sensor's capacity to detect an alarm condition prior to it's actual physical installation. What this means is that the installer should manually test each detector BEFORE determining the unit's final installation location. Another type of glass breakage sensor actually sticks to the window glass. It's either in the form of a silver (or gold) foil that runs around the perimeter of the glass pane, or in the shape of a one inch square or round plastic button with wires coming from it. The foil has to be physically broken (which usually happens when the window it's stuck on is smashed). The "bug" I mention is more of a shock sensor. A sharp rap on the pane with a screwdriver or other hard object will usually cause it to "alarm". are not to be confused with motion detectors. Most often they utilize infrared light energy, but instead of being "passive" (that is strictly an infrared sensor), a beam system requires two separate elements to complete the "circuit", namely an emitter and a receiver. Both these units are mounted facing each other. The emitter shines a beam of infrared light at the receiver. When the beam is broken, the receiver trips the alarm. A less expensive "cousin" to this type of unit is usually seen in a lot of retail stores. When a customer enters the store, he usually "breaks the beam" and a chime or buzzer is sounded to alert the shopkeeper to the presence of the patron. In a security system, beam detectors can literally become invisible "walls" or "curtains" of protection, and since the detectors housings can be easily disguised or hidden, an intruder usually won't know where or when he breaks the beam. Note: Interior protection is designed primarily to protect objects and personal property, not people. Most often these devices are bypassed when the room or area is occupied by the legitimate owners or users. Ultrasonic Detectors: These are motion sensors that are rarely utilized today because of the advances made in the PIR detector and the shortcomings identified with this technology. These types of detectors utilize high frequency sound (a frequency well beyond human hearing) and something called the "Doppler Shift" (an effect caused by a target or individual moving towards the sensor) which activates detection circuitry and causes the sensor to "alarm". Unfortunately over time, the high frequency sound emitted by the sensor can become modulated to a lower frequency and begin to disturb pets in the home. Cats & dogs that refuse to enter certain rooms in the house or act differently when in the same room as one of these detectors are sure signs that the sensor may require adjustment or replacement (usually the latter). The major drawback with these types of sensors is the ease with which they are "cheated". An intruder that recognizes the distinctive shape of the sensor has only to walk through the room PARALLEL to the sensor. As long as he/she doesn't approach the sensor, the "Doppler Shift" essential to the units activation will not occur. These devices are specially designed to be concealed either under room carpet (or rugs) or under the floor. When an intruder steps onto the protected floor, he triggers the alarm. These sensors are more commonly used in highly travelled areas (like hallways), or surrounding a specific area or object that requires protection. A Lease usually has a fixed term (usually three to five years renewable for consecutive one year terms), low (sometimes FREE) installation costs, but high monitoring or service charges. Companies most often offer to allow the customer to purchase the equipment at a fair adjusted market value after the end of the initial term. This can be viewed as a major disadvantage in that the actual cash expenditure over the term of the lease may be higher than the initial cost of an outright purchase. The advantage is that the installing company usually offers free maintenance (excluding damage from outside sources) for the life of the lease contract. We've all been subjected to the radio ads flogging the latest and greatest voice response monitoring systems (the fact that the one that's most actively advertised happens to come with free installation doesn't make it better). In many cases (if not all), the equipment is sold over the telephone and the installing technician is required to upsell the customer on-the-spot if he feels the "basic package" is inadequate (oh, the PRESSURE!). In addition, you're required to sign a contract which locks you in for a period of three (3) years. The cost of any additional equipment is usually prorated onto the monthly monitoring charge. A single door contact (or two) and a motion detector made "pet proof" by mounting it up-side-down is not going to give you the level of protection you deserve! We can also categorically state that security control panels that offer two way voice communication with a central monitoring station have been available for longer than a certain company has been publicly marketing it. For a company to claim that they offer the "best security" and are "the most trusted" because they heavily promote "two way voice" communication simply isn't true. If you're really keen on the technology ask ANY Dealer if their station's receiver is capable of processing signals from a voice activated panel. Chances are they'll say yes as most of the central station receivers employed today in fact are fully capable, and contrary to the what the ads might claim, there usually isn't any additional cost to you. This technology provides the subscriber's alarm control unit with the ability to transmit alarm signals to the central monitoring centre wirelessly (without the need for an actual telephone line). It's often sold as a back-up in case a smart burglar may decide to sever the lines going into your house and circumvent the normal means of signal transmission. While your strategizing over which type of system and payment options best suits your budget, you might also want to consider including some technologies designed to protect your family from the "silent killer". If your home employs gas burning appliances (stove/cook tops, fireplaces, hot water tank, or furnace), a carbon monoxide detector and interconnected smoke alarms are worthwhile (and important) additions to any modern home alarm system. Even the best security system in the world needs to be regularly tested. Most alarm manufacturers suggest a weekly test regimen, but this can be adjusted to a daily test should the need arise. All modern alarm equipment is capable of transmitting a self-test signal, and in most cases involving a "monitored" system, this normally occurs on a daily basis. The automated test signal verifies the communicator is operating correctly. It does not ensure the alarm system itself (or the peripheral devices it employs) is working, however. Consult your owners manual and follow the suggestions of your own alarm provider in formulating your system's test schedule. The Canadian Security Association (CANASA) - "Finding the right system." The Electronic Security Association (ESA) - "Get Informed!" Disclaimer: Neither CANASA or ESA are affiliated with the Fire Protection Technicians Network, and do not endorse this website. How do you change batteries in a smoke alarm and properly test it? Modern smoke alarms have either front, side, or rear mounted battery compartments. The front (or side) mounted units are designed to make it easier to change the stand-by battery without actually removing the detector from its base. There are several videos available on “youtube” that, while helpful in demonstrating the technique involved in removing the detector from the ceiling, fall short when it comes to the proper procedure to follow when changing the battery(ies). In every case, you should remove the detector from its base. It may also be helpful to download and read the manufacturer’s installation and maintenance guide as some modern alarms incorporate an integral sealed battery you can’t replace (it has a ten year life). 1. To remove the detector from the base, you twist it either clock-wise or counter clock-wise. It will only move in one direction, so exercise some discretion as to how much force you use. Don’t let go of it as it comes off. Pull it gently away from the base. 2. With the detector removed from the base, you’ll notice it has a small plastic plug on the back with three wires coming out (usually black, white, and a third wire that can be either orange, red, or yellow). Squeeze the two tabs on either side of the plug together and pull it free of the detector. 3. Open the battery compartment and remove the old battery. 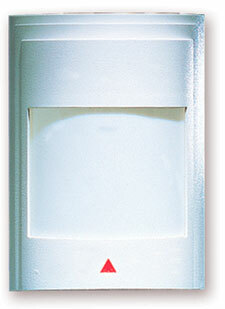 Check the date code on the back of the detector and make sure it’s within ten (10) years from manufacture. If it’s over ten years old, you should replace the unit. Let’s assume the detector is within the ten year cycle. 4. With the soft brush attachment use your vacuum to thoroughly clean all around the vents of the detector. NEVER USE CANNED OR COMPRESSED AIR TO BLOW OUT THE UNIT. If the unit has been beeping the “low battery” alert, leave it unpowered for at least five (5) minutes. 5. Insert a new, current dated, high quality alkaline type battery (Duracell or Energizer). Make sure that you position the red lever (if one has popped up when you removed the old battery) so that it’s depressed as you insert the new one. 6. Close the battery compartment and push the “test” button until the unit sounds. (This is the step on most of the videos I’ve seen actually miss doing). It’s an important one as it tests whether the alarm responds on battery power. If it fails to sound, you’ve either mis-aligned the batteries or the terminals inside the compartment aren’t making adequate contact. Open the compartment and make the necessary adjustments. 7. Once you’ve completed the battery test, you can plug the unit back in. The plug will only go in one way (it’s keyed). The green “power on” light should illuminate. 8. Relocate the detector back onto its base, and push the “test” button once more until the unit responds. This ensures it’s functioning on normal household power. If you have more than one smoke alarm installed in your home, they may be interconnected to all sound together when one is activated. You may have to hold the test button down for a longer period while someone goes around and makes sure they’ve all activated. 9. Light a candle. Blow it out and hold it directly under the detector so that the smoke impinges on the detector’s vents. The unit should sound within a few seconds. This tests the proper operation of the alarm’s detection chamber. Do not blow cigarette smoke at the detector. Tar and nicotine will clog the chamber and inhibit its operation (much like they do your lungs). IMPORTANT NOTE: If your SINGLE FAMILY dwelling is equipped with a fire sprinkler system your smoke alarms are interconnected to it through a device called a flow switch. Your sprinkler system will also feature a back-flow preventer that must be tested on an annual basis to ensure it’s functioning properly. The back-flow preventer is installed to stop stagnant, contaminated sprinkler water from entering the domestic supply. You’ll need to engage the services of a qualified professional to perform and document the required testing. At the same time, they should also flow water through the inspector’s test which should activate the sounders in your smoke alarms. The motion detector in my house is mounted a lot lower than my neighbours and is up-side-down. Is this normal? Chances are it's about three to four feet from the floor, right? There's only one reason I can think of that your motion detector is mounted this way. Your installer has elected to provide you with a "pet alley" (an area immediately below the level of the sensor has been created using this rather "quick fix" method so that your pets can roam freely without risking a false alarm while you're out). Is it "normal"? Not really. There are a number of premium motion detectors that are specifically designed to "ignore" pets while still providing the same level of protection as the normally mounted sensor in your neighbour's house (and you won't have to suffer with this big "hole" in your security). If however, you happen to have pets and have a system installed by a well known "voice response" provider, then you're stuck for the rest of your contract term. When you're no longer under contract, my advice would be to get yourself a REAL alarm system. I have a DSC POWER 632 security system with an PC-5508 LED keypad. My problem is on my alarm system I have 6 active zones that run from 1 through 6 on the keypad. The zone 8 light is on and I'm sure that's why I cannot set my alarm. I have changed out the battery. The trouble light on my DSC Power 632 PC5508 keypad is on. What does this mean? If you don't have your manual, you can download a copy from the DSC website. Pressing "*" then "2" will activate the trouble display. If the zone 8 LED illuminates, you have to reset your system's clock. Press the "#" key twice to exit the trouble mode. Press "*" then "6" and then enter your master code. Press "1", the keypad will beep several times. Enter the current time (in military format), then press "#" twice to exit. Your trouble light will extinguish. Zone 1 - General Trouble press "1" to advance to the next display level. We have several Kidde combination carbon monoxide/smoke alarms installed in our home in Huntsville, Alabama, which we purchased about four years ago (the house was built in 2004). We’ve been replacing the batteries about every two years. Last night, the combo unit in the basement started chirping about every 30 seconds. We replaced the battery, but it continued to chirp until my husband finally took it down completely. This morning the one outside of our bedroom is exhibiting the same problem (chirps every thirty seconds or so despite the fact that it has a fresh battery). What is the problem? What does “ERR” mean on the digital display of my carbon monoxide alarm? This is indicative of an internal failure of some sort. It could have been precipitated by a power failure or surge, or simply the loss of communication with the internal processor. If, when you remove your unit from its base, the date stamped on the back of the unit indicates it might be approaching seven years of continuous operation, then this may be the “end-of-life” indicator for the sensor. If, however, you’re still within the seven year cycle, then try this method to reset your detector. Unplug it from AC power and remove the batteries. Leave the unit UNPOWERED for five (5) minutes. At the end of the five minutes, press and hold the “test” button for thirty (30) seconds. Insert new high quality alkaline type batteries (please observe the correct polarity when you do). Plug the unit back in. It will go through a self-test cycle and may display a number of odd symbols and numbers (888). It should revert back to a “0” with a small decimal “point” flashing steadily. This means you have successfully reset the processor. If the “ERR” message comes up again, the unit must be replaced. It is no longer functional. Kidde and BRK have excellent warranties for their products. You may wish to visit their web sites to download the manual for your model and the instructions for obtaining a return material authorization (RMA). If I wanted an alarm to sound when a window was shut, how would you accomplish this (set up a circuit to do this)? Nothing really special is required other than hooking up an appropriate contact (in this case one that’s normally open). Most security systems employ normally closed contacts for doors and windows. This means that when they’re in proximity to a magnet, (which would be the case when the door or window was closed), the circuit is a complete. When the door/window opens, the circuit is broken causing the zone to fault (or alarm if the system is armed). A normally open contact would operate in the opposite manner. The circuit would be closed with the window open and fault when the window is closed. I’ve recently had to change the battery in my Honeywell alarm system and it’s now displaying a “FC” at the keypad. Did I do something wrong? “FC” is a trouble indication that means “Failure to Communicate”. This means that your system has somehow missed transmitting a signal to your monitoring station. Please ensure that the telephone cord from the common control is properly plugged in to its jack. If you’ve changed telephone providers recently, this could very well be one of the causes as well. VOIP service, in particular, can play havoc with an alarm system’s ability to communicate with a central station receiver. If your new Internet connection employs DVACS, then you will have to install a filter on the line so that your security system can transmit signals properly. Is there anything I should know about my switching my telephone service to Vonage? If by “Vonage” you mean VOIP (Voice Over IP) service, then there are several things you should know. First off, the VOIP modem has a rechargeable backup battery that will power your telephone line for between four and six hours in the event of a power failure. If the failure lasts for longer than this you will no longer have telephone service and your security system will be unable to communicate alarms and troubles to the central station. 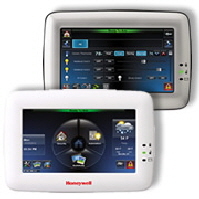 In addition, communications between your central monitoring station and your home could become compromised as many older panels don’t recognize the dial tone, or worse, will miss the cue from the station receiver that prompts your panel to transmit its status (alarm, trouble, or test signal). Many burglar alarm companies have taken the step to issue written dire warnings to their customers about switching to VOIP. While the service is often cheaper than telephone services provided by traditional companies like Bell, Telus, and AT&T, the overall reliability of VOIP communications relies on a stable connection to your Internet Service Provider (ISP). There is additional information on our Communicator TIPS page as well as this FAQ. What are the pro’s and con’s of using a telephone-based type enterphone system? Can call a resident’s cellphone (doesn’t require the tenant to maintain a land-line). Easy to upgrade (or replace). Monthly business rate charge from your telephone service provider applies to the base unit (main entry phone panel). Only a single line is required (can be shared with multiple entry panels in the same complex). Unless the tenant has opted to include a “call waiting” feature in their normal service, visitors may receive a busy signal when attempting to contact the tenant. Requires tenants to provide either a cellphone or landline phone number. Calls are routed through a fixed termination block located adjacent to the main incoming telephone demarcation block. Tenants receive a unique ring-tone even when on an outside call (no busy signal for visitors attempting to contact the tenant). No monthly fees (other than to the residents/tenants who may have opted for their own landlines). No programming required (unless tenant wishes to have their name appear on the directory). Calls are routed to suite numbers or unit numbers. Requires tenant to supply a touch-tone telephone to plug into stationary jacks located in the suite (or unit). Cannot be routed to a tenant’s cellular phone. More difficult to maintain and service (in many cases, the equipment is proprietary to the manufacturer who may have designated a single local service agency, or dealer). ** NOTE: Programming most enterphone systems is more easily accomplished with a computer and software that can download the necessary changes through either a dedicated connection to the enterphone’s main board or by calling the base unit’s telephone number (where a “phone bill type” system is utilized). What causes a loss of supervision signal at the keypad for a door? The fact that your security provider has included properly supervised circuits in your establishment is indicative of the quality of your particular installation and the technical knowledge and integrity of the installation staff they employ. A “loss of supervision” could be caused by someone tampering with a door contact. In UNSUPERVISED circuits, the door contacts are usually “normally closed”. What this means is that the control panel sees a “short” on the circuit as a “normal” condition. A “short” can be achieved through bypassing a ”normally closed” switch (shorting the circuit). When this occurs, the zone becomes non-responsive (i.e. won’t show a “fault” condition if the door is opened). In systems employing supervised circuits however, this would cause a “trouble” (loss of supervision signal) or will “fault” the affected zone(s). How do you change the programmed telephone number on a DSC PC-5508Z alarm system? This is done while in INSTALLER MODE programming. On a monitored system, your service provider could also perform this function via a telephone download link.